There’s a world war on. The enemy: tobacco. Some 173 countries have ratified the World Health Organisation Framework Convention on Tobacco Control (FCTC), the first treaty under the WHO constitution. It came into force in 2005, and its goal is to “to protect present and future generations from the devastating … consequences of tobacco consumption and exposure to tobacco smoke”. Today is World No Tobacco Day, and it comes as the fight for cleaner air and cleaner lungs has gone global. The countries that have ratified the treaty represent 87 per cent of the world’s population. By signing, they have agreed to standards meant to ban tobacco advertising, promotion and sponsorship, put health warnings on packages, bar sales to minors, protect citizens against second-hand smoke, and raise taxes on tobacco. They are also supposed to share health data and information. Hong Kong is in position to be a leader in its region, a tobacco control expert says. The Western Pacific Region, which covers Hong Kong, has the most smokers of the WHO’s six regions. But it is also the only region to have all countries ratifying a global health treaty on tobacco control. Scientific studies show that smoking kills one in two smokers, but the habit is becoming less popular in the West. According to the Tobacco Atlas, the smoking rate in developed countries fell by about 30 per cent in the past two decades. So tobacco companies are switching their attention to the developing world, where the smoking population is rising. Global sales of cigarettes reached 6.3 trillion sticks last year – up from 5 trillion in 1990 – and three-quarters of the buyers were from developing countries. And it is a profitable strategy. According to The Independent on Sunday, the big four tobacco companies – Philip Morris International, British American Tobacco, Japan Tobacco and Imperial Tobacco – made more than HK$324 billion profit last year, up from HK$312 billion in 2009. Mackay said Hong Kong was not doing badly in the battle to reduce smoking. Its smoking rate of 12 per cent is the lowest in the region. But, it could do more, Mackey said. It should start a five- or 10-year plan to raise the tobacco tax, she said. It should change the pictorial warnings on cigarette packaging every two years, “as smokers tune out after a while”. Plain packaging should be introduced in the next three years, and owners of places such as bars, pubs, restaurants and malls should be held responsible if people light up in their venue. At present, it is just smokers who can be fined if caught by the Tobacco Control Office. The city should take more action against illicit cigarettes and smuggling, and should insist that cigarettes sales become “under-the-counter” in shops, she said. But the city’s experience could also be a model for the mainland, which she said was “moving slowly in the right direction”. The mainland banned smoking in all indoor public spaces, although compliance has been unsatisfactory. She urged the central government to commit to tobacco control and fully implement the framework convention as soon as possible. 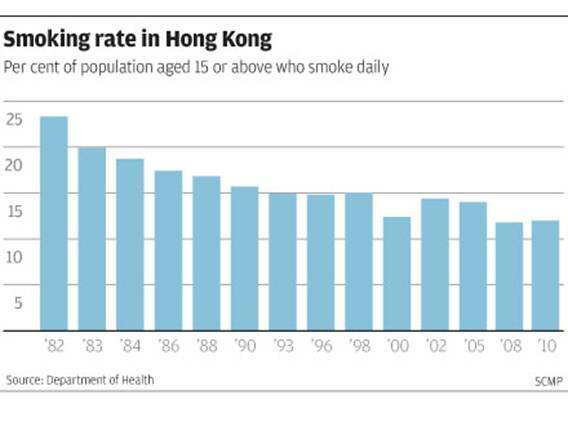 Hong Kong is one of the better performing parts of the world when it comes to quitting smoking. Between 30 per cent and 43 per cent of smokers who joined quit programmes by the Hospital Authority and the Department of Health stayed smoke-free for a year, data from the schemes show. That is higher than the international average of 25 per cent to 33 per cent. The quit centres operated by the Tung Wah Group of Hospitals claim a success rate of 40 per cent. Helen Chan Ching-han, supervisor of the group’s Integrated Centre on Smoking Cessation, said this was because it offered counselling for individuals with regular follow-ups. “A lot of services focus on medication, but we focus on psychology. We try to understand why smokers pick up the habit, and help them avoid temptations,” she said. She said if smokers were counselled as a group, it could be embarrassing for them to raise personal questions. Every year, more than 6,000 of the city’s 750,000 smokers try to break the habit through an organised programme. They can either call a hotline, 1833 183, or visit any of the clinics operated under the department, the authority or the Tung Wah Group of Hospitals. The Pok Oi Hospital offers traditional Chinese medicine and acupuncture sessions to smokers who want to quit. The hospital’s fleet of 18 vans ferry acupuncture practitioners and herbalists to give help and advice six days a week around the city. The University of Hong Kong also operates quit-smoking hotlines, focusing on groups such as young people and women. The average waiting time for Health Department services is one week, while authority patients need to wait for up to four weeks. Smokers who choose the TWGHs centres can join the service in less than three days, with the longest queue in the Mong Kok clinic. A new clinic, the organisation’s fifth, will open in Kwun Tong tomorrow, joining others in Sha Tin, Wan Chai and Tuen Mun. Kwok said the authority would offer free nicotine patches and other medications – enough to last around three months – in October, after the government injected more funding and increased the number of counsellors for the programme. The department is talking to the World Health Organisation to set up a centre to train medical workers as quit-smoking counsellors. The centre will be part of an international network and called the Collaborating Centre for Smoking Cessation and Treatment of Tobacco Dependence. But it is still in the planning stage. In the authority’s programme, 43 per cent of participants successfully stopped smoking for a year. Ruby Kwok Lai-ping, the authority’s senior manager in primary care, said the figure was so high because most of their clients were already suffering from tobacco-related diseases. “Our clients are referred by doctors and nurses. They are already hospital patients, and their motivation would be stronger than those who have not suffered from disease,” Kwok said. The Tobacco Control Office will launch an e-learning programme for medical workers later this year on quitting smoking.